What are the Columbus holiday* lights shows, tree lighting you can’t miss? Wildlights at the Columbus Zoo? Fantasy of Lights at Alum Creek? Something with a small town feel? What is your Can’t MISS Columbus Christmas* light display? Gahanna? Missed it! No, I think Creekside displays lights throughout December. Of course the tree lighting, the grand illumination of local lights is just the beginning. You can drive or walk down High Street in Worthington and it is going to look like a Christmas card throughout December. Creekside in Gahanna is gorgeous and lit up for weeks to come. Ditto for Dublin, etc. etc. etc. 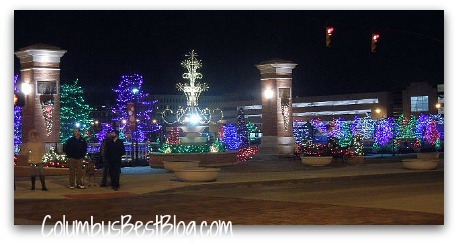 I saw beautiful professional photos of Easton lit up for the 2012 “Holidays” online. Twitter? Facebook? Google+? It was a link to the local photographer’s photo of Easton on Flickr. Pretty stuff. Can’t do that with the camera on my phone… or my point and shoot. Or in this lifetime. I started to go collect info about local “Holiday Light Displays” recently… and I found a link to a page online for the Fantasy of Lights at Alum Creek and got all confused. The dates are November 16 to January 1. The copyright notice on the bottom of the page says 2008. I can not cast stones though since the copyright date here stalled at 2009… (?) The Fantasy of Lights page I am on though looks more like 2005… with animated snow. Sorry that sounds so snarky and uncharitable at Christmas time or Holiday time. The page looks festive in a 2005 way. Although the Channel 10 2012 Holiday Lights page does not say 2012 and the link (url) does not say 2012, the tab is showing 2012. Chris Bradley was in Dublin last night too so that works with the list on Channel 10. The site says “Please note that the light displays will be located at the Alum Creek State Park Campgrounds this year, not the Alum Creek Marina. “ The number to call for info is 740-369- 2900 or was. I have never been to the Alum Creek light show. It’s a drive through light show. I went to a drive through light show in Columbus, one year, I want to say it was at Griggs Reservoir? It’s warmer than Wildlights at the Columbus Zoo. * Christmas goes better with Columbus and “Can’t Miss” in the headline on ColumbusBestBlog.com. Most of the light shows are called “Holiday” because it is 2012. I will probably say Happy Chanukah Columbus this month. I may wish you a great winter solstice. If you have a holiday event you are celebrating share it on ’365 Things to do in Columbus Ohio’ on Facebook. The link is in the Blogroll on the side bar here on ColumbusBestBlog.com. You can share your holiday photos on that Facebook page. Or not.